This entry was posted on March 5, 2013 by Scott Ridl. 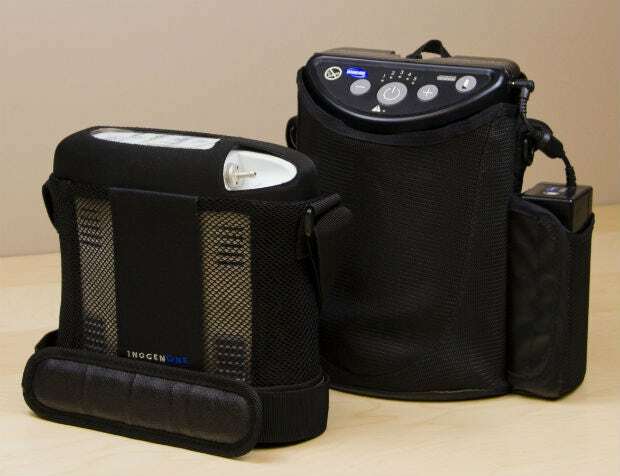 The Inogen One G3 Portable Oxygen Concentrator and the Invacare XP02 Portable Oxygen Concentrator are both state of the art, compact and lightweight oxygen therapy systems. Both portable concentrators are designed to give you the freedom to live your life and even travel without worry about tank refills or running out of oxygen. Here's a closer look at the similarities and differences between the Inogen One G3 and the Invacare XP02 to help you decide which portable oxygen machine is a better fit for your lifestyle. The Inogen One G3 is one of the smallest and most lightweight portable oxygen concentrators available on the market. The Inogen One G3 weighs just 4.9 pounds and is only 7.25 inches tall, 8.75 inches wide and 3 inches deep. The Inogen One G3 does not look like a medical device. It is housed in a sleek matte white plastic case with silvery blue accents and is inconspicuous in your home and while you are on the go. The Inogen One G3 is small enough to be held in your hand and comes with a sleek carry bag to allow for easy mobility. The G3 does not have a washable filter but does have internal filters that need to be replaced every 1 - 2 years. Like the Inogen One G3, the Invacare XP02 is also a clinically robust ambulatory oxygen concentrator in a lightweight and compact package. The XP02 weighs 6 pounds with the built-in battery and 7.3 pounds when combined with the included supplemental battery. At 10 inches tall, 7 inches wide and 4 inches deep, the Invacare is a slightly larger machine than the Inogen One G3 but is still small enough to travel with you around town and on trips easily. The Invacare XP02 concentrator is housed in a semi-circular black plastic casing. The XP02 comes with a black, mesh, removable carrying case that fits seamlessly over the concentrator. The XP02 looks like a small personal air purifier and blends easily into home atmospheres. Like the Inogen One G3, the Invacare XP02 has an internal filter that needs to be replaced every 1 - 2 years. The Inogen One G3 comes with one 8-cell battery. The battery of the G3 is easily attached to the concentrator by sliding it into the battery slot on the back of the unit. The included 8-cell battery is capable of running for up to 5 hours when the Inogen One G3 is operated on setting 1. A 16-cell battery with a battery life of up to 10 hours is available for purchase. Additional 8-cell batteries are also available for purchase to increase the amount of time you can be away from home between charges. Battery life between charges decreases when the G3 is operated at higher pulse dose settings. The 8-cell battery of the Inogen One G3 recharges entirely in about four hours. The Invacare XP02 comes with both a built-in battery and a supplemental battery. Each has a battery life of up to 3.5 hours when fully charged and operated at Setting 1, for a combined battery life of 7 hours. As with the G3, the XP02's battery life decreases as it is operated at higher settings. For example, at Setting 5 each battery has up to a 1-hour duration when fully charged. Both batteries recharge in about three hours when connected to power and not in use. The batteries can also be charged while the XP02 is in use, but recharge time increases. Both the Inogen One G3 and Invacare XP02 come with AC and DC adapters to give you the freedom to power and charge the devices at home or in the car. Both concentrators are also FAA approved for use on all US aircraft. Oxygen concentrators run on the air in the room or the environment around it, ensuring that you never run out of oxygen. The Inogen One G3 and the Invacare XP02 are both pulse dose ambulatory oxygen concentrators. The Inogen One G3 has pulse dose settings 1 - 4 and delivers up to 840 ml of oxygen per minute when used at the highest setting. The G3 puts out oxygen concentrations of 87% - 96%. The Invacare XP02 has pulse dose settings 1 - 5 and can deliver up to 900 ml per minute of oxygen at the highest setting. The XP02 puts out oxygen concentrations of 87% - 95.6% at all settings. The Inogen One G3 has five buttons to operate the machine. A large On/Off button and two triangular buttons are used to turn the machine on and off and switch between pulse dose settings. The G3 also has an audible alarm button to turn the audible breath detection alarm on and off. A backlit display button makes the Inogen One G3's display easier to read in dark rooms. The large, easy to read display on the control panel displays the setting being used, the amount of battery life remaining, and whether the audible alarm is on or off. A breath detection light and an alarm light are also present on the control panel so that you always know how you are responding to your oxygen therapy. The Invacare XP02 features four easy to use button controls. The Invacare has a one-touch power button to turn the concentrator on and powers down by holding the button. Large plus and minus buttons allow you to control the pulse dose setting of the XP02 easily. A fourth button indicates the battery life remaining on the machine. A battery gauge and alarm indicator light are also featured on the top control panel of the XP02. The Inogen One G3 Portable Concentrator comes with an included 8 cell battery, AC and DC power supplies, a shoulder-strap carrying bag and cannula. The XP02 concentrator kit comes with a built-in battery and supplemental battery, AC and DC power adapters, an accessory bag and carrying case. A cannula and replacement filter are also included with your purchase of the XP02. Both the Inogen One G3 and the Invacare XP02 are ambulatory oxygen concentrators designed to let you live your life without worry about running out of oxygen. Both devices are approved for use on all US aircraft by the FAA. With long battery lives, both the Inogen One G3 and the Invacare XP02 allow you to travel on battery power alone. The compact Inogen One G3 is the smallest option of the two and fits easily into your hand. The Invacare XP02 is slightly larger than the Inogen One G3 but boasts a longer battery life between the built-in battery and the included supplemental battery. Extra batteries are available for purchase for both the Inogen One G3 and Invacare XP02, increasing the amount of time you can be away from home between charges. With either the Inogen One G3 or the Invacare XP02, you are free to garden outside your home, visit the park or zoo with grandchildren, and even travel. the inogen 1 g2 is very heavy!! !